2. Cook pasta according to directions. 3. In a large skillet (oven proof)* melt 1 tbsp butter and sauté garlic and shrimp. Remove from pan and set aside, do not drain. 4. Whisk together cornstarch, chicken broth, and milk. 5. Add 2 tbsp butter to skillet. Once melted, add milk mixture and salt and pepper. Simmer 3-5 minutes. Once it begins to thicken, add ¾ cup mozzarella and Parmesan cheese to mixture. Stir until cheese is melted. 6. 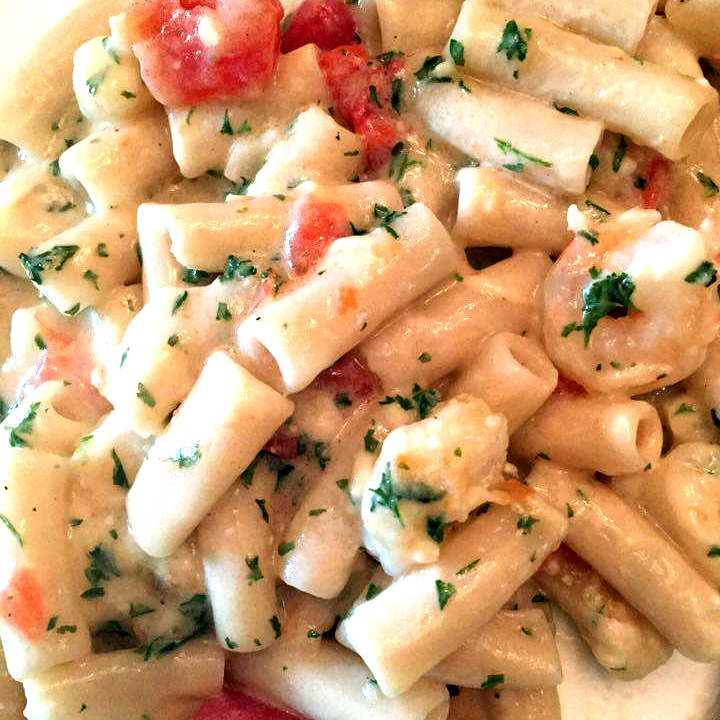 Add shrimp, tomatoes and pasta to skillet. Simmer for 2-3 minutes. 7. Transfer to casserole dish (keep in skillet if oven proof). Sprinkle with remaining cheese and bake for 5-7 minutes to melt cheese. Broil for 2-3 minutes to brown cheese if desired.